Now you can play “Cut the Rope” game online for free. This is an addictive puzzle game where we have to feed this little monster named as Om Nom. 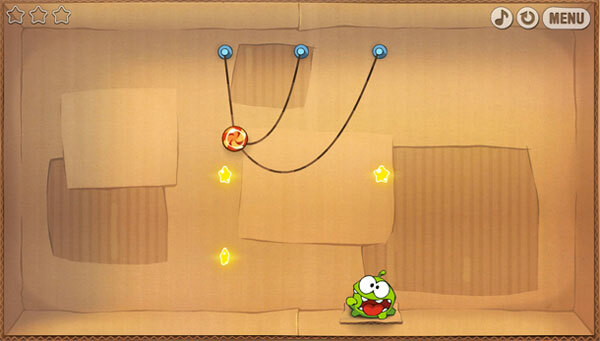 The player needs to cut the rope in such a way that Om Nom gets that delicious candy. This game is a top paid game in Android market. The good news is that ZeptoLabs has created an online version of Cut the Rope, so that anyone with a browser can enjoy this game online. This is a premium (paid) game on Android, iPhone and iPad. On Android platform, this game costs just $0.99. The best part is that now anyone can play this game online for free, no need to spend even 99 cents for this game. The site suggests Internet Explorer 9, but it works perfectly fine in Google Chrome and also in Mozilla Firefox. Play Cut the Rope game online for free at cuttherope.ie. Its recommended to use the latest version of browser. The game uses HTML5, the latest in web technologies and grants many levels which are playable online. Playing this game is very easy. Just select an area to cut the rope of that area, but you need to do this wisely, so that our little monster gets his candy. If you are using IE9, then the game unlocks 7 exciting levels never seen before. Some other most popular games on mobile platforms are also available online. For example, Angry Birds online and also Fruit Ninja can be played on any live website. It seems that this is done to present the game to a more wider audience – the audience that uses computer all the time. Or whatever game developers motive would be, let’s start enjoying this game from the browser, right now. The game is definitely addictive and as you progress levels, things would get difficult. Go, try out this game.